If you had download apps and games on your Mac that you no longer use, it is better to delete those Apps. 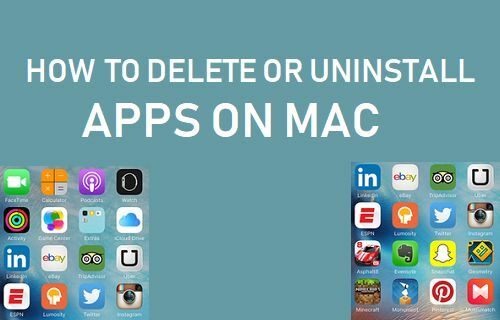 You will find below multiple ways to uninstall apps on Mac. Apple’s App Store has tons of Apps and games and this can easily tempt anyone to download many Apps on Mac. However, most people eventually realize that they do not really use the Apps that they had downloaded from the App store. Hence, we are providing below multiple ways to delete unwanted Apps from Mac. You can use any method that appears easy and is applicable in your case. An easy way to Uninstall Apps on Mac is by going to the Launchpad on your Mac. 1. Click on the Launchpad Icon located in the Dock of your Mac. 2. On the next screen, press and hold the Option key on the keyboard of your Mac and you will find all the Apps jiggling on the Launch Screen. Click on the X icon located at the upper left corner of the App that you want to delete (See image below). 3. In the confirmation pop-up, click on the Delete button to confirm deletion. If you do not see the X icon next to the App that you want to delete, it means that this particular App came pre-installed with your Mac and it cannot be deleted. The reason behind preventing certain System Apps from being deleted on Mac is to maintain proper functioning of your device and to protect the overall user experience that Apple wants to provide its users. All the Apps that you have downloaded from the App Store will be available in the Applications Folder and such Apps can be easily deleted. 1. Click on the Finder Icon, located in the Dock of your Mac. 2. On the next screen, click on Applications in the left-pane. In the right-pane, right-click on the App that you want to delete and click on Move to Trash option in the contextual menu. 3. If prompted, enter your Admin Password in the pop-up and the App will be moved to Trash on your Mac. Note: You can also drag the App to Trash. After the App is moved to trash, you can delete the App from the trash can immediately or the App will be removed when you empty the Trash. If the App that you want to Uninstall is difficult to find, you can use Spotlight Search to find the App and remove it from your Mac. 1. Click on the Search icon located at the top-right corner of your screen. 2. In the Spotlight Search Window, type the Name of the App that you want to delete. 3. Once the App comes up in search results, press and hold the Command Key on the Keyboard of your Mac and double-click on the App that has come up in search results. 4. When you double-click on the App, you will be immediately directed to its current location of the App. Right-click on the App and click on Move to Trash. The App will be Uninstalled and moved to the Trash can on your Mac. If you had downloaded the App from the internet, you can delete this App by going to the Downloads folder on your Mac. 1. Click on the Finder Icon located in the Dock of your Mac. 2. Next, click on Downloads in the left pane. In the right-pane, right-click on the App that you want to delete and click on Move to Trash option. The selected App will be immediately moved to the Trash on your Mac.